2 © 2013 The SmartenIT Consortium 2 Commercial in Confidence Goal  Reduction of energy consumption via load aggregation and turning off physical machines. 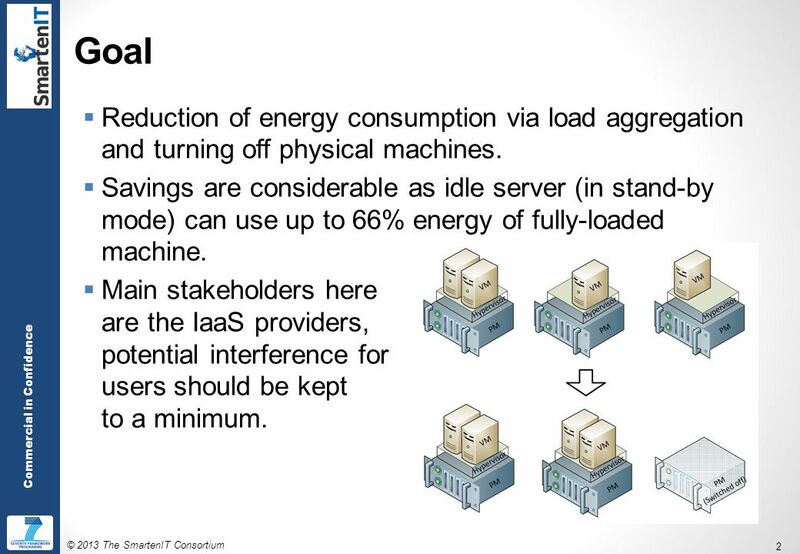  Savings are considerable as idle server (in stand-by mode) can use up to 66% energy of fully-loaded machine.  Main stakeholders here are the IaaS providers, potential interference for users should be kept to a minimum. 5 © 2013 The SmartenIT Consortium 5 Commercial in Confidence Procedure  Physical Machines (PM):  Track your L j (sum current D i ’s)  Prompt housed VMs to check random PM whenever VM leav6es or joins this PM (alt. only when leaves)  (alt) Send L j to S-Box  Virtual Machines (VM):  Initial pick (random by default, alt. recommended by S-Box)  Check random PM when prompted by PM. (alt. 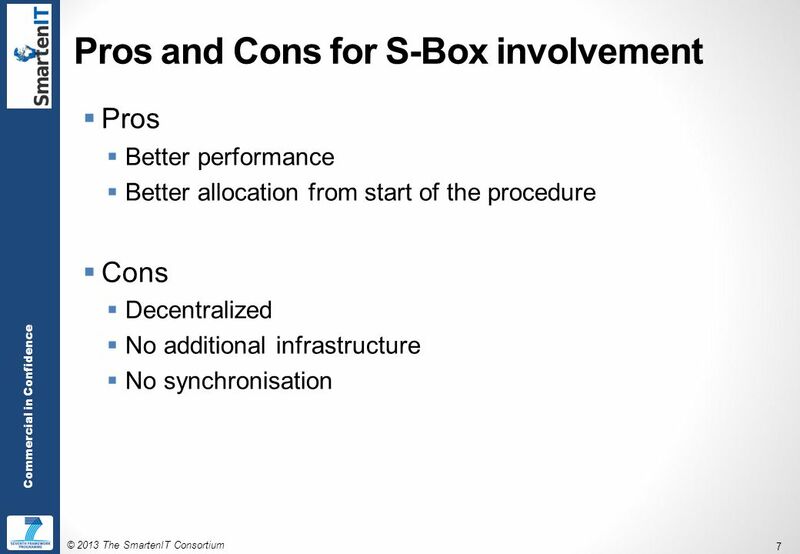 check S-Box)  Migrate to another PM if energy efficiency there is lower by given threshold.  Threshold is used not only to aviod unnecessary migrations, but also to balance power savings and delay caused by migration. 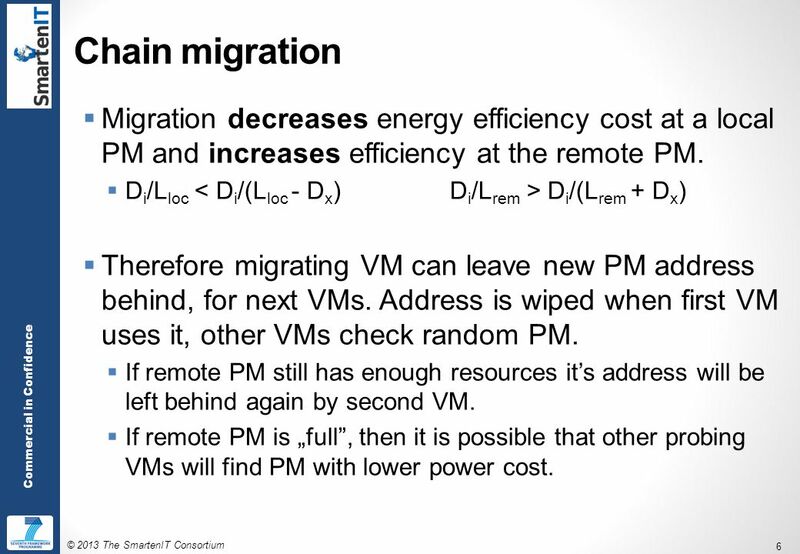 6 © 2013 The SmartenIT Consortium 6 Commercial in Confidence Chain migration  Migration decreases energy efficiency cost at a local PM and increases efficiency at the remote PM. 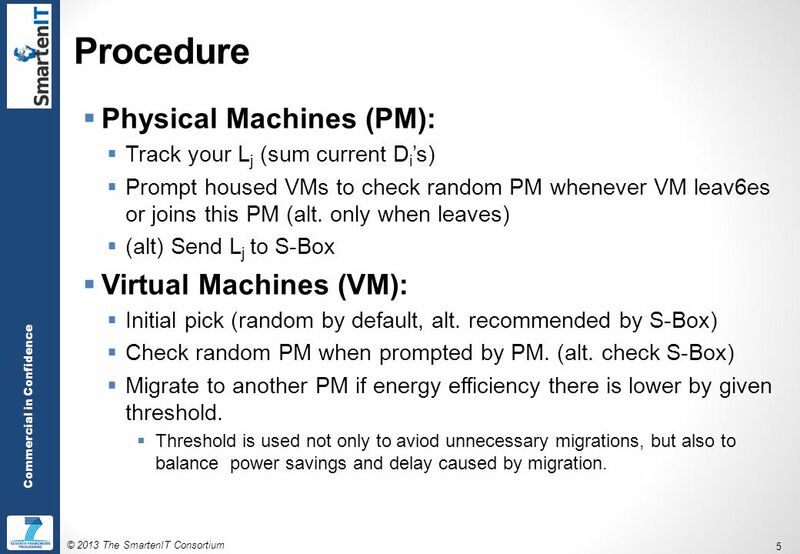  D i /L loc D i /(L rem + D x )  Therefore migrating VM can leave new PM address behind, for next VMs. Address is wiped when first VM uses it, other VMs check random PM. 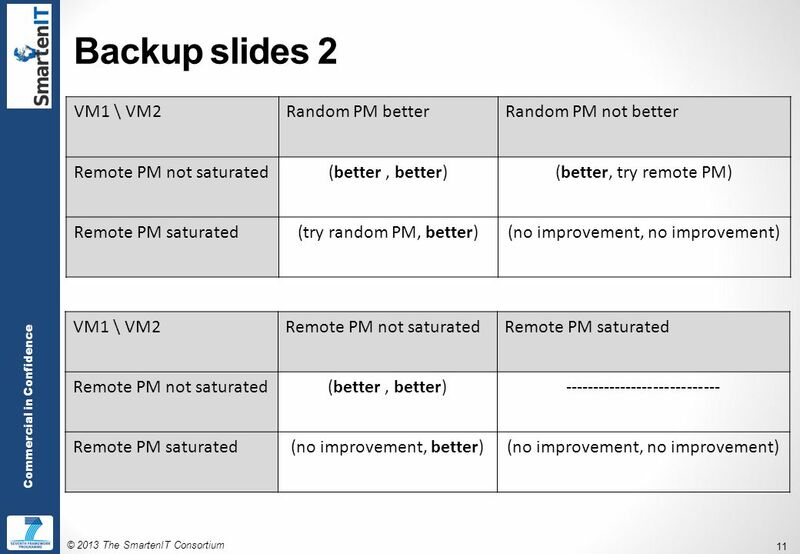  If remote PM still has enough resources it’s address will be left behind again by second VM. 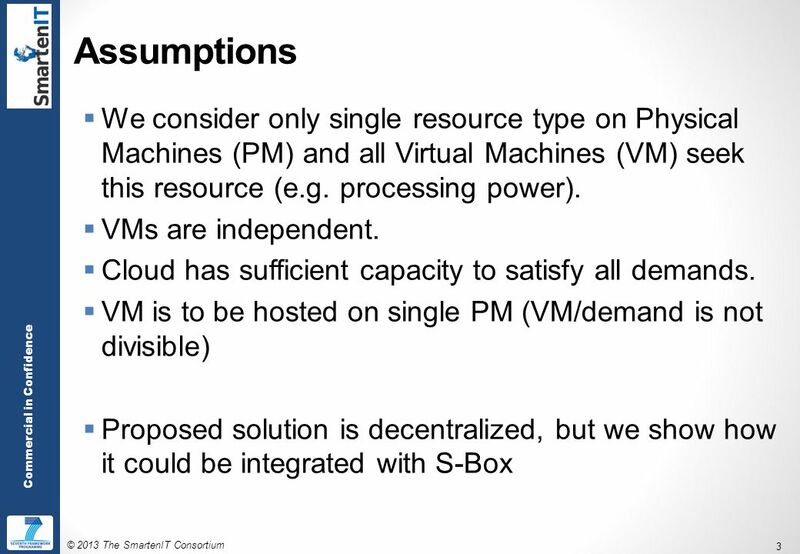  If remote PM is „full”, then it is possible that other probing VMs will find PM with lower power cost. 8 © 2013 The SmartenIT Consortium 8 Commercial in Confidence To be adressed  Dynamics – potential area for social awareness. 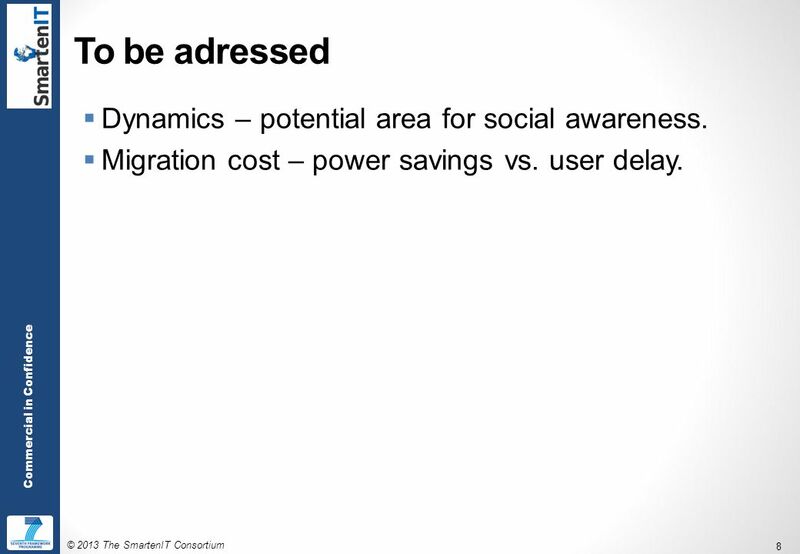  Migration cost – power savings vs. user delay. 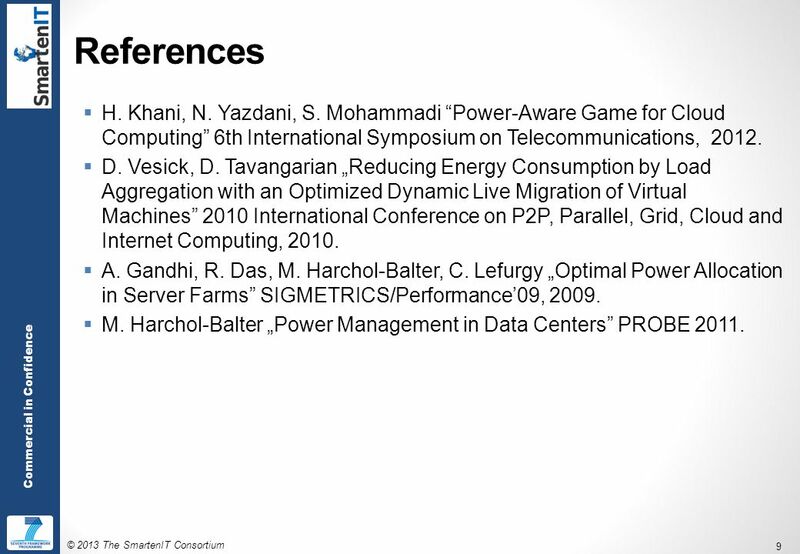 9 © 2013 The SmartenIT Consortium 9 Commercial in Confidence References  H. Khani, N. Yazdani, S. Mohammadi “Power-Aware Game for Cloud Computing” 6th International Symposium on Telecommunications, 2012. 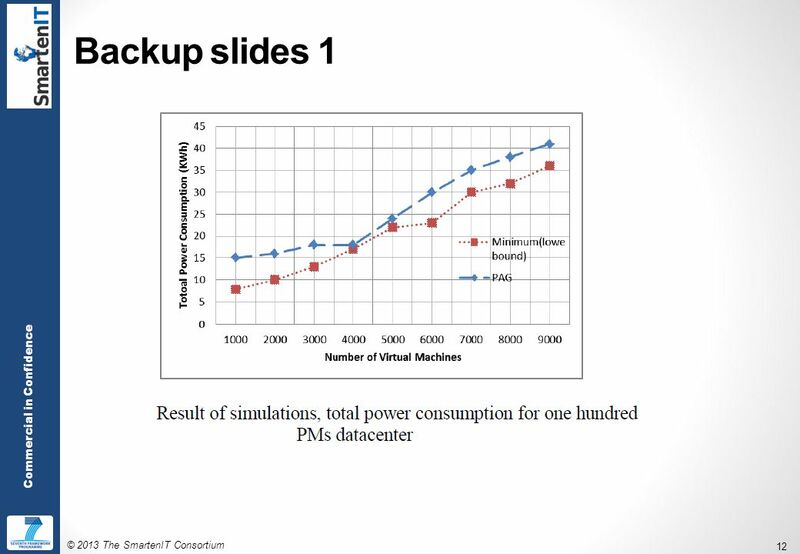  D. Vesick, D. Tavangarian „Reducing Energy Consumption by Load Aggregation with an Optimized Dynamic Live Migration of Virtual Machines” 2010 International Conference on P2P, Parallel, Grid, Cloud and Internet Computing, 2010. 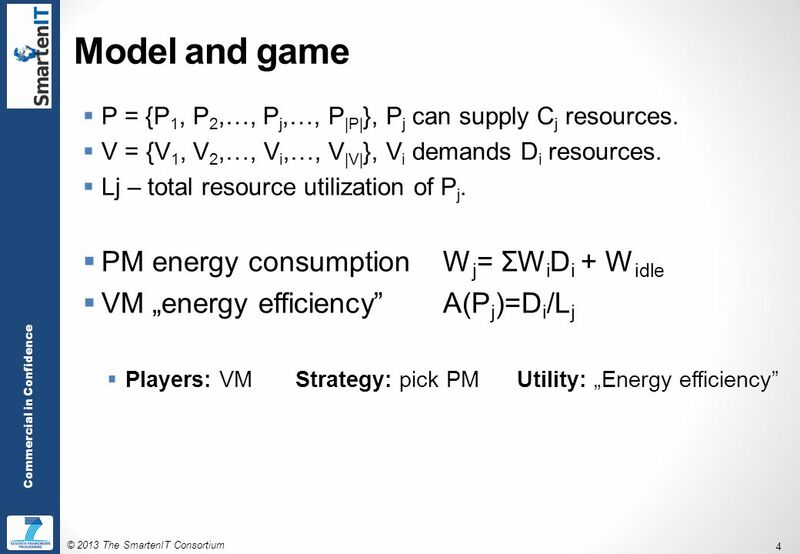  A. Gandhi, R. Das, M. Harchol-Balter, C. Lefurgy „Optimal Power Allocation in Server Farms” SIGMETRICS/Performance’09, 2009.  M. Harchol-Balter „Power Management in Data Centers” PROBE 2011. 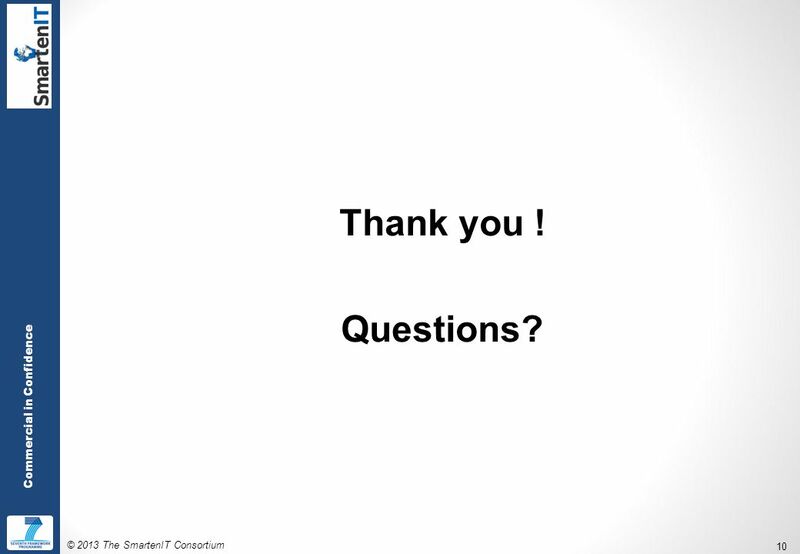 10 © 2013 The SmartenIT Consortium 10 Commercial in Confidence Thank you ! Questions? 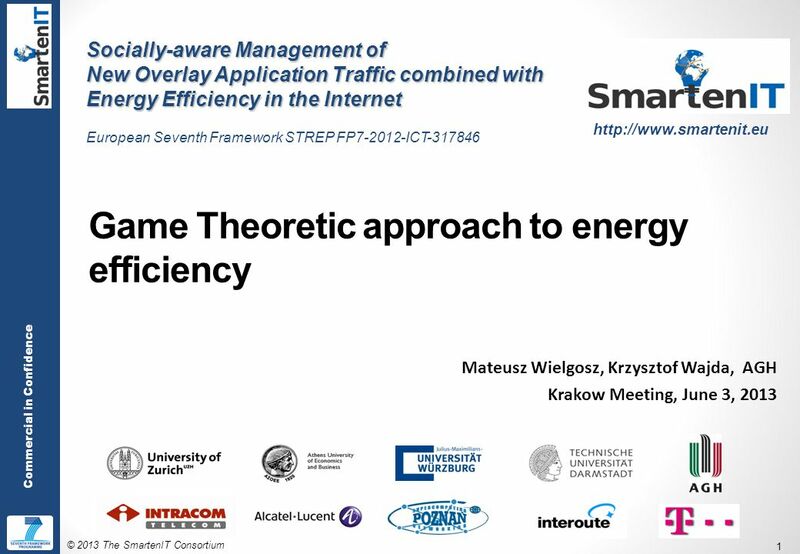 Download ppt "© 2013 The SmartenIT Consortium 1 Commercial in Confidence Game Theoretic approach to energy efficiency Mateusz Wielgosz, Krzysztof Wajda, AGH Krakow Meeting,"
Demand Side Management: Concept, Need and scenario in West Bengal Saroj Sarkar Engineer (Retd.) WBSEDCL 1. Ramya (UCSB), Parthasarathy et al (HP Labs). Overview Power delivery, consumption and cooling problems in a data center are being tackled currently by. Dr.-Ing. Halid Hrasnica Eurescom GmbH – AIM project coordinator Intermediary conference of the European thematic network. Scaling The Edge Bridge Address Table In Datacenter Networks June-2012. Dynamic Traffic Management (DTM) for minimization of inter- domain traffic cost Rafal Stankiewicz, Zbigniew Dulinski AGH University of Science. PATH SELECTION AND MULTIPATH CONGESTION CONTROL BY P. KEY, L. MASSOULIE, AND D. TOWSLEY R02 – Network Architectures Michaelmas term, 2013 Ulku Buket Nazlican.